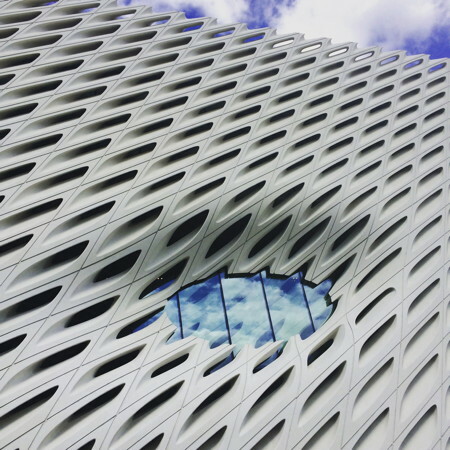 An amazing art collection, housed in an astonishing building that — itself — is an iconic work of art, The Broad art museum opens in downtown Los Angeles this Sunday and posits L.A. as one of the primary destinations for modern art. L.A.’s newest contemporary art gallery is a gift to the city from philanthropists and longtime collectors Edye and Eli Broad. 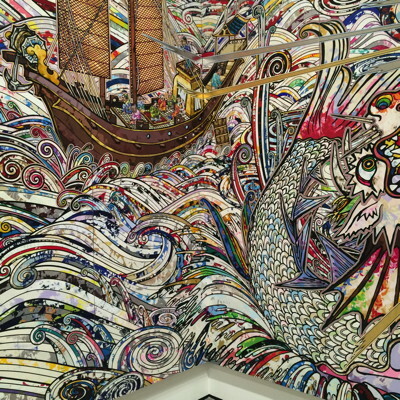 The Broad is free to the public. You can just rock up there (although there may be a wait to get in if the museum is packed) or you can make advance scheduled reservations to visit by going here. The Broad will be open six days a week, closing Mondays, and will stay open until 8 p.m. on Thursdays, Fridays and Saturdays. Admission will be free at all time. On Sunday it opens with an exhibition of more than 250 highlights from the massive collection gathered over several decades by its founding couple. 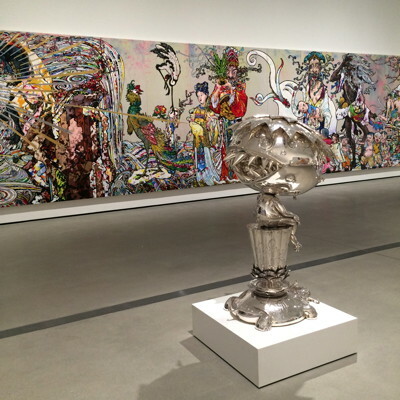 The Broad will be home to 2,000 works of art in the Broad 50-year amassed collection, which is among the most prominent holdings of postwar and contemporary art worldwide. Designed by Diller Scofidio + Renfro in collaboration with Gensler, the 120,000-square-foot, $140-million building, features two floors of gallery space to showcase The Broad’s comprehensive collection as well as a level devoted to storage. The iconic structure will be the headquarters of The Broad Art Foundation’s worldwide lending library. 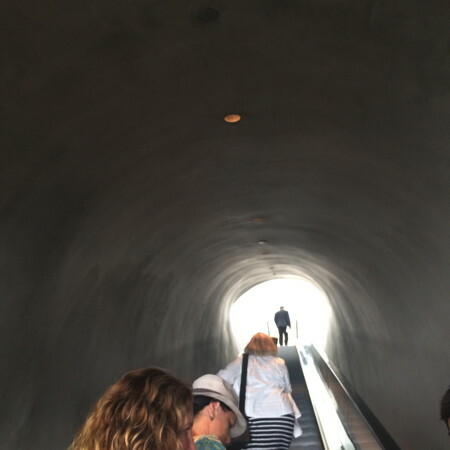 From the undulating, cave-like ground floor, you travel up a long, 100 foot escalator to pop out into the bright exhibition space, drenched with indirect yet natural sunlight. 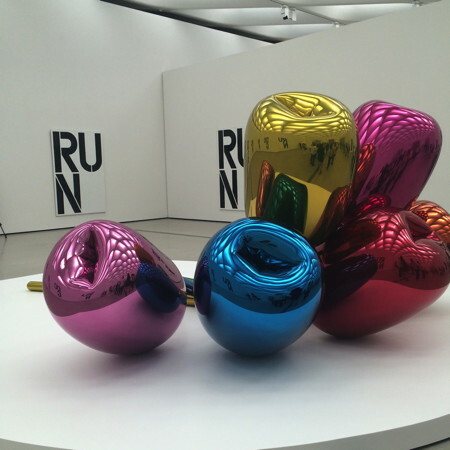 The first things you will see once you emerge from the long, dark, narrow tunnel into the bright, airy and spacious upper level is the vividly-hued works of Jeff Koons. 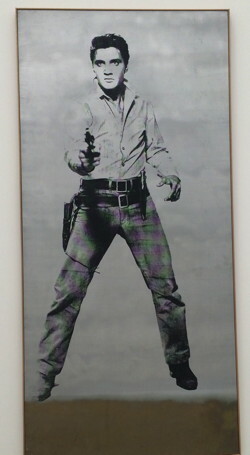 The Broad’s possess the largest private collection of his over-sized and whimsical works. The upper level presently houses many iconic modern art works from the 50’s and 60’s, including a whole room devoted to Andy Warhol’s memorable screen prints and paintings of key figures such as Jackie Kennedy, Marilyn Monroe and Elvis Presley. 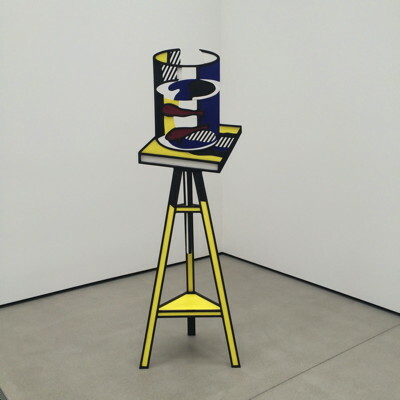 There’s also a whole room of paintings and sculptures by pop artist Roy Lichtenstein. Untitled (Your body is a battleground) 1989. 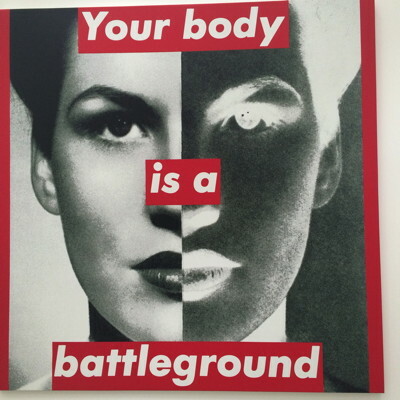 Barbara Kruger. Untitled (#61 Burning City) 1981. Jack Goldstein. 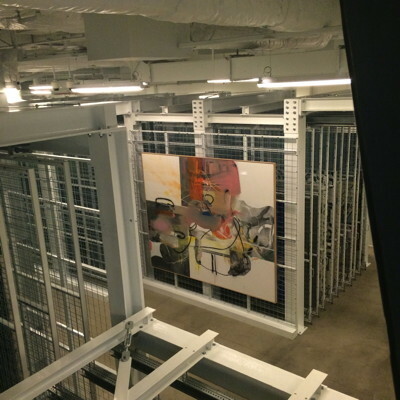 The Second Level is devoted to storage of the 2,000 works in the collection that are not on loan or on display. There are conference rooms and lecture spaces as well. In anticipation of the museum’s opening, The Broad Art Foundation and the Eli and Edythe L. Broad Collection continued to acquire major works and add new artists to expand upon the representation of cutting edge and provocative contemporary artwork that will be shown in the museum’s soaring galleries. 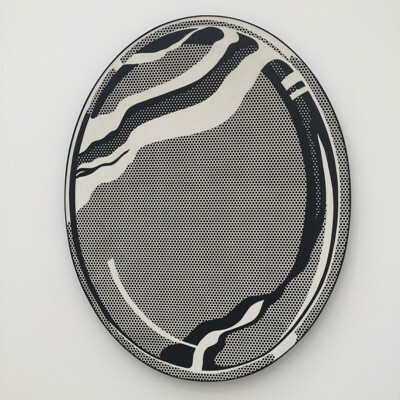 Over the past year various acquisitions were made, including Yayoi Kusama’s Infinity Mirrored Room, Ragnar Kjartansson’s The Visitors, Julie Mehretu’s Beloved (Cairo) and Robert Longo’s striking and spooky large work Untitled (Ferguson Police, August 13, 2014) 2014 – a diptych of charcoal on mounted paper, found on the first (ground) floor. 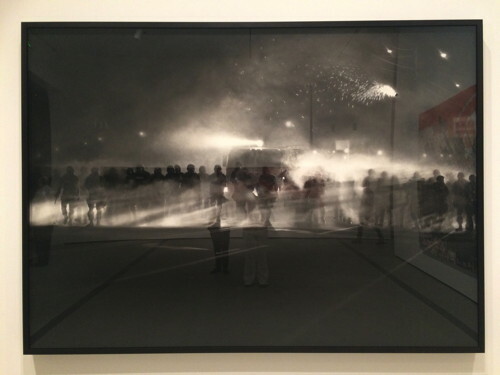 Untitled (Ferguson Police, August 13, 2014) 2014. Robert Longo. The two philanthropic groups have added 89 works in the past two years, taking The Broad’s representation of contemporary art in new directions, said Joanne Heyler, founding director of The Broad and director and chief curator of The Broad Art Foundation. 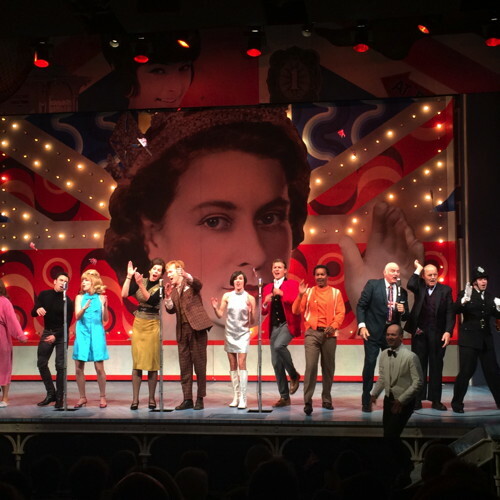 New artists include Ragnar Kjartansson, Yayoi Kusama, Thomas Houseago and Julie Mehretu. Major video and installation works by Reykjavik-based Kjartansson and Tokyo-based Kusama add to the Broad collections two new highly regarded examples of immersive and experiential art. The Houseago and Mehretu acquisitions add two ambitious and large-scale works to the collections. 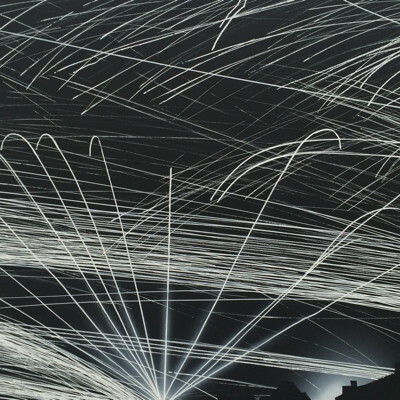 The Broad collections, which for more than 40 years have been building in-depth representations of individual postwar and contemporary artists, also continued deepening their noted and distinguished holdings by Andreas Gursky, William Kentridge, Jeff Koons, Ed Ruscha and Cindy Sherman. 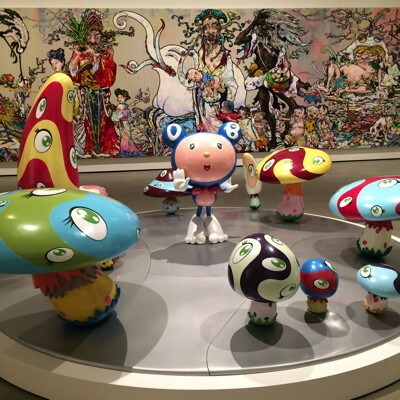 A whole room is devoted to the vibrantly colored and pop-culture-celebratory, cartoony art works of Takashi Murakami, including a recent acquisition of long work made from twenty panels that runs across two walls. A special experience on the first (ground) floor is a discrete room entitled the Infinity Mirrored Room – The Souls of Millions of Light Years Away, 2013, by contemporary Japanese artist Yayoi Kusama. This is an immersive work comprising a mirror-lined chamber housing a dazzling, and seemingly endless, LED light display. You experience it by entering the small room solo, standing on a narrow ‘jetty’ while surrounded by lights and water. You are in there for only 45 seconds, so make the most of it! Make sure to book your time in this room as soon as you arrive at The Broad. They will text you 10 minutes before your time so you can wait in line to be admitted. 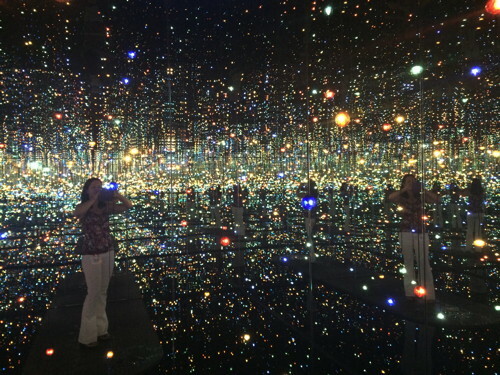 Infinity Mirrored Room – The Souls of Millions of Light Years Away, 2013. Yayoi Kusama. 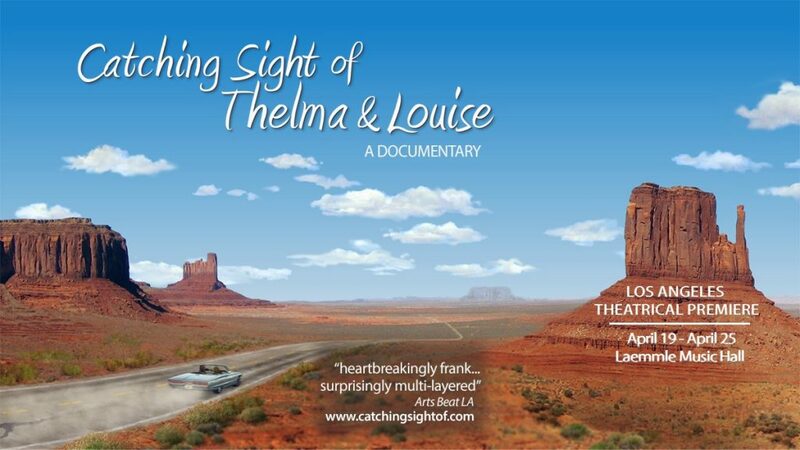 Admission is free, but reservations are recommended. You can make advance scheduled reservations for your visit by going here. Tuesday and Wednesday | 11 a.m. – 5 p.m.
Thursday and Friday | 11 a.m. – 8 p.m. 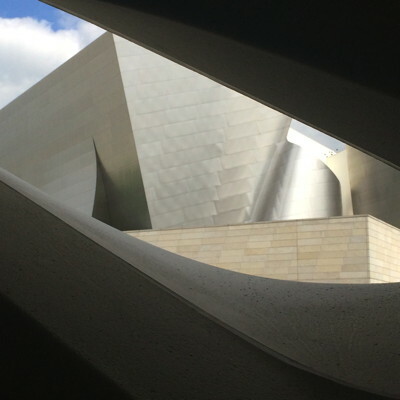 The Broad will be closed Thanksgiving Day and Christmas Day. Ticketing issues or questions? Please call 213-232-6200. If the line is busy or if it is after business hours, please leave a voicemail and they will return your call as soon as possible. You can also email.